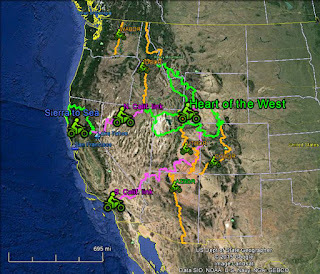 Heart of the West Adventure Route -- the plug-and-play solution to the risks of planning an overland trip -- is further refined for 2019 as a roundabout of interconnected wildland loops and routes. Today, this premium service facilitates overland journeys that can extend from Canada to Mexico, and from the Rocky Mountains to the Pacific Ocean. H.o.W. (in the photo above) has always been an adaptable, GPS-guided 2,800-mile-plus loop along backcountry roads through some of the American West's most iconic landscapes. But over the last few seasons, we've chronicled routing that can extend the experience far beyond H.o.W. 's original six states. optional connectors (at additional cost) to Northern and Southern California. 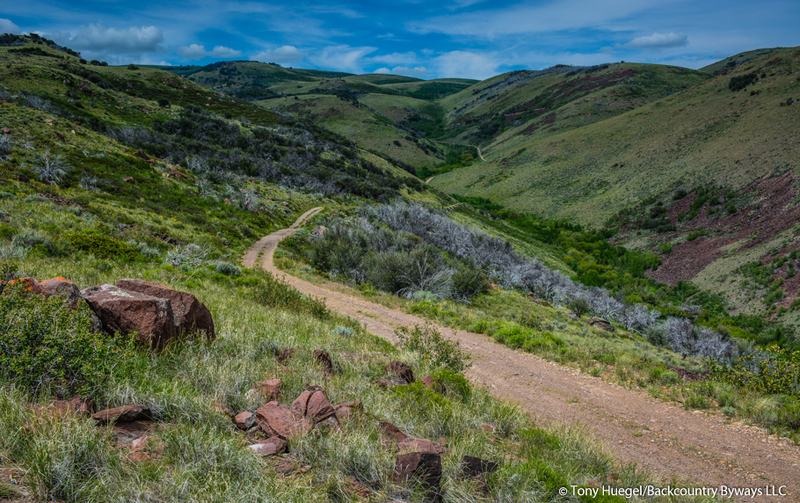 By taking a modular, looping approach to wildland route development, we've made it easy to tailor H.o.W. to your interests, logistics, time limitations and circumstances. An example: We've included our 200-mile (322 km) Nevada extension. It links the primary H.o.W. 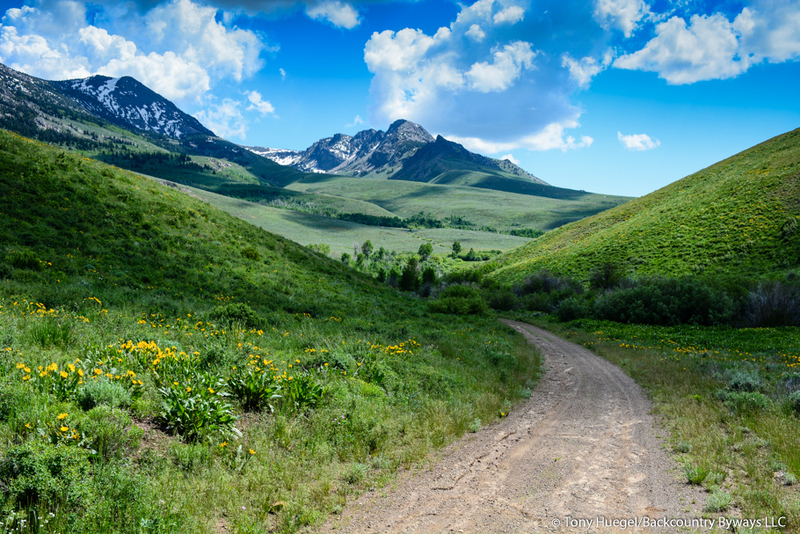 network to the Idaho and Nevada Backcountry Discovery Routes. 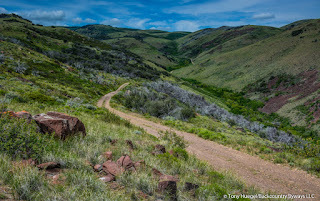 An exhilarating wildland experience by itself, this connector ascends deep into the rugged and surprisingly verdant mountain ranges and canyons of the Silver State's northernmost reaches. Our 575-mile (925km) Northern California connector. Backcountry travelers now can make their way to or from California, following 19th-century wagon routes across the Great Basin between the Sierra Nevada, the H.o.W. roundabout, the southern terminus of the Idaho Backcountry Discovery Route and the northern terminus of the Nevada BDR. Note: This option also connects the H.o.W. roundabout to our 825-mile trans-California route, Sierra to the Sea (see below). Sierra to the Sea/Sea to Sierra Adventure Route (S2S). This 825-mile (1,328 km), east-west trans-California route follows historic gold-rush era and emigrant roads and trails. 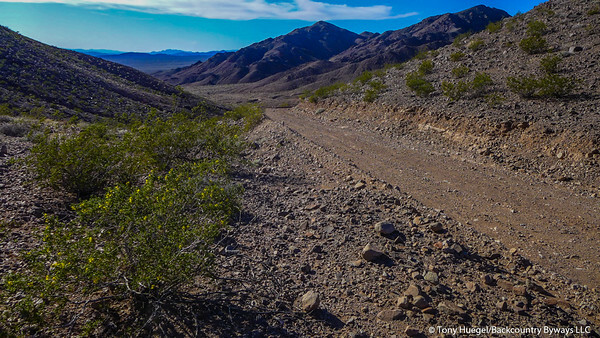 Included is the option to begin or end at Reno, Nevada, via the last remaining unpaved trans-Sierra road. the largest coastal wildland in the Lower 48. Fee: $199/1-2 vehs; $299/3-4 vehs. Utah's canyon country, including Moab. Woven together, our web of interconnected routes makes it easy to tailor a wildland journey to your interests and circumstances. In advance of each season, H.o.W. 's routes are revisited and revised if necessary to incorporate changes, and new challenges and opportunities. Heart of the West extends deep into the Great Basin, one of the most remote and sparsely populated regions in the Lower 48. Long, lonely segments of the historic Oregon Trail enable travelers to sample the 19th-century emigrant experience. Lonely two-tracks reach deeper into multi-hued badlands. And alluring wildland backways have replaced tamer state and county roads. 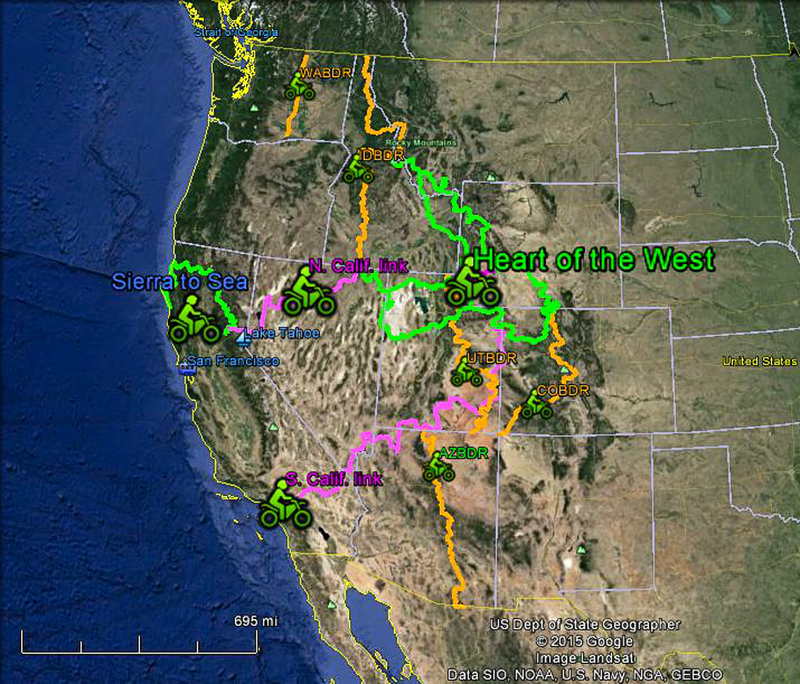 built-in links to the Colorado, Idaho, Nevada and Utah Backcountry Discovery Routes. Optional ($60; not available separately) is the H.oW. Map Pack. This includes: a detailed, color, wall-mountable 36 in. x 43 in. (91.44 cm x 116.84 m) folded-paper map with each track numbered and highlighted to match the track file; H.o.W. stickers; and a weather-resistant roll-top pouch. The map is produced in partnership with Benchmark Maps, America's leading publisher of high-quality recreation-and-travel maps and atlases. Shipping is included within the contiguous USA. Perhaps best of all: Heart of the West includes rewarding, field-tested options to shorten, modify and adapt the full, ~2,800-mile (4,500 km) loop to accommodate time-limited or changed itineraries. So no matter what your schedule will allow, Heart of the West ADV Route can be adapted to fit your needs, even as you travel. A second license is required according to the same fee schedule thereafter. PayPal users, please add 3 percent to help defray the fees PayPal imposes. PayPal is the most commonly used method of payment, but other forms may be accepted. Contact us for details. The total fee for the complete package (detailed track file; map pack; e-booklet; consultations; plus a 3 percent PayPal surcharge) for 1-2 vehicles: $267.00 USD. Another benefit: Our clients are eligible for substantial discounts on premium motorcycling gear and map products. So ... start planning for H.o.W. now! Contact us using this site's contact form (helps avoid spammers), and we'll help you get on your way. Time and again, those who've traveled Heart of the West find one phrase to describe the experience: "Trip of a lifetime!" And you don't need to be an enduro champion or veteran four-wheeler to enjoy it. You just need a good adventure motorcycle, 4x4 truck or sport-utility vehicle, the skills to travel in the backcountry safely, the ability to follow the comprehensive GPS track we provide -- and a yearning to venture well off the beaten track. Our detailed, plug-and-play GPS data file will guide you accurately along every mile of the route. With the routes that Backcountry Byways LLC develops, you get highly detailed data that is researched, documented and monitored by wildland-travel specialists with decades of on-the-ground experience in both adventure-motorcycle and SUV-borne overland travel. Instead of only the basic GPS tracks and a handful of location markers (waypoints) so typical of free routing, H.o.W. includes more than 1,200 essential waypoints for verified campsites and campgrounds, lodgings, fuel stops, difficult sections and more. Each is pinpointed using Global Positioning System coordinates, by direct on-site observation. Importantly, H.o.W. isn't just a product; it's a premium service. That service and support begins when you sign up, and ends when your adventure is done. Going far beyond typical crowdsourced routing ("You get what you pay for! "), we provide prompt, professional and personalized service and support. Our clients have exclusive "anytime" access to the person most knowledgeable about every aspect of the route, someone who can provide counsel that is prompt, convenient, and authoritative. Our premium support means our clients don't have to subject themselves to hours mining social-media forums for credible input from strangers and amateurs. We get to know our clients. Many become friends and return year after year. So we often can tailor our products and services to suit their interests and circumstances. We're available when they need us, just a phone call or text message away from start to finish ... even as they travel! Perhaps you're the DIY type, willing to risk your group's vacation to save a few bucks ... spending hours scouring websites and fielding suspect responses on social-media forums ... ordering maps (USD$10 to $15 ea. ), atlases (USD$25 ea.) and guidebooks (USD$20 ea.) ... consuming hours of cell-phone time ... struggling for weeks to build a GPS track following roads across unfamiliar terrain -- only to learn the hard way that a road no longer exists! We say ... Do it your way! Focusing on the western USA's unpaved backroads, Heart of the West Adventure Route takes overland travelers through some of America's last-remaining, least-populated and most spectacular wildlands that remain motor-vehicle accessible. the final segment of the world's first Transcontinental Railroad. Other backcountry routes run east-west or north-south, and so must omit a great deal. More important, they pose logistical difficulties, e.g., getting to the beginning and returning from the end. They require arranging a shuttle or return bike shipment; or enduring massive "slab" time on backtracking. Heart of the West Adventure Route is efficient and convenient. That's because it's comprised of a main, grand loop with optional interconnected loops. Begin and end anywhere that works for you. If you can't break free for the 15 or so days the full loop typically requires, travel it in segments, over time, at a pace that's right for you. The loop is intersected by two interstate U.S. highways: north-south I-15 and east-west I-80. Connecting to I-70 -- a major access route to Utah's canyon country -- is convenient as well. So travelers from every point on the compass are saving precious vacation days with fast and direct access. Major airlines serve cities at logical entry/exit points, e.g., Denver, Colorado; Salt Lake City, Utah; Jackson Hole, Wyoming; even Idaho Falls, Idaho! Connections are available as well to Las Vegas and Reno, Nevada; Moab, Utah; and Grand Junction, Colorado. Vehicle storage is often available at local airports and motels. You can camp, stay in motels, or pause for a relaxing evening at a mountain lodge. 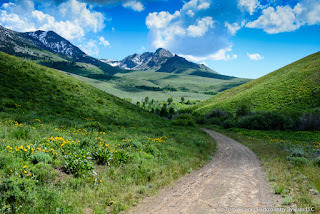 We will connect you to a web gallery of images that depict the route. It's not a sales tool, but rather a comprehensive survey that will show you what to expect. We'll also provide payment details (we are traveler-direct service providers). And you'll receive the advantages of the 25 years we've spent chronicling the wildland roads of the American West for guidebooks, magazines, automotive manufacturers, web publishers ... and busy people like you. 1. Connect with us via the contact form on this site's sidebar. 2. Schedule a telephone visit. This enables us to acquaint you with the H.o.W. experience further, and to answer your questions. 3. We provide payment details. 4. Once payment is received, we deliver the H.o.W. track file via email. 5. USPS Priority Mail delivery of the optional ($60) map pack, if you choose to purchase it. 6. Adding you to the list of H.o.W. travelers who will receive exclusive news alerts or revised data that we sometimes send out during the travel season for which your license is acquired. These emailed alerts can involve updates on road conditions, closures, wildfires, new routing and more. If warranted, they also may include a revised or supplementary track that can be downloaded to your GPS device and added to the route. Many wildland travelers can require post-purchase assistance. So our personal service doesn't end with providing the track file. * Additional fee and at least 90 days advance notice required. We are available for consultations, fee-based custom routing ($1,050 minimum) and supplementary logistical support. Just ask! Our goal, after all, is to help you have that "trip of a lifetime." Still have questions? Send us a note using the "Contact" form in the sidebar. Hello Tony! Just found your site. When do you recommend doing Heart of the West? Trying to stay away from snow and tick season in the sagebrush. Hello, back! Snow I know about. But I've never experienced ticks along HoW. September, especially the middle or latter part of the month, has consistently provided HoW travelers with the best conditions. Temps are cooler, the weather is more stable, and the quaking aspens and cottonwoods are turning color. June, July and August are typically hot and wet. Some road segments remain closed by regulation until July 1. In September, however, campers will find nights getting cold, especially in mountain valleys. But the mosquitoes are gone! So the ideal time to travel HoW is coming up fast. Are you ready? Tony, about how much of the route is unpaved? Approximately 15 percent involves one form of paved road or another. That's an improvement, for our explorations during the 2013 season replaced many miles of paved roads (previously used to make important connections) with long segments of fun, even historic wildland two-track trails. Hello, Is the route doable with a URAL Patrol? I am only worried about steep climbs. The URAL is under powered and I had to turn back when the wife and I took it to CO last year. I'm sure the primary route would be doable, perhaps with omitting one or two steep and rocky segments and choosing the provided bypasses. But for an a segment or two, the primary route doesn't have much steep terrain. In any case, once you're on board, I'll be happy to work with H.o.W. clients to go over the details and work through the options. This route is, by design, very adaptable. Is there a recommended max width and height for the vehicle? I'm interested in doing this with a custom camper built on a Mitsubishi Fuso 4x4? Mike, there are narrow two-track segments, readily bypassed if that truck seems too large. One optional spur on the Continental Divide would likely be inadvisable in that rig. But have a look at the photos in the H.o.W. online album, which accurately depicts the roads and the route, and see what you think. The link is in the blog post. I've read a number of trip reports on the ADV site. Are you aware of anyone who has completed all or part of the Heart of the West route in a 4wd vehicle and published a report about it? 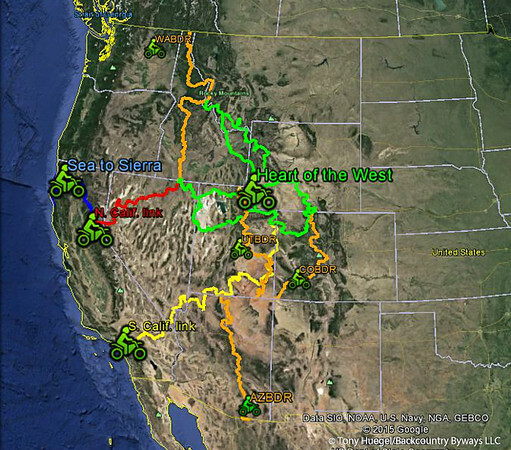 A number of expeditionportal.com forum members have driven Heart of the West Adventure Route, at least in part. I know of one fellow who completed it in a Toyota Tacoma; and two in Land Cruisers who terminated early due to breakdowns. I've driven it in 4Runners and Land Cruisers with no greater mishaps than ruined tires (carry two spares ...). I am unaware of any four-wheeled trip reports, but you might post a query on expeditionportal.com and see what feedback you receive. Members of the adventure-motorcycling forum ADVrider.com are the most prolific when it comes to trip reports. If you have further questions, Kyle, just send me a note at: backcountry byways at gee mail dot com.